These days everyone is made aware of the importance of cell phone or mobile phones in the life of an individual. According to one recent survey approximately 90 percent out of 100 people are mobile users. Now I would draw the audiences attention towards the draw backs of this utility oriented technology which unfortunately is misused to a great extent. Positive progress and to pace with the present times is always recommended but excess of every thing is bad. Mobile phone has gradually become an addiction and a pernicious gadget. Not only this device is increasingly becoming a public naissance but indeed it has contributed for wrong reasons. It's a fact that there is a large number of youth who are mobile users and most of them have no idea why they are using mobile phones. Therefore mobile phone is fad and vogue that has bugged the young generation one can hardly deem that why a school going child needs a mobile phone while he is suppose to dedicate himself to his studies. There is another side of this reality that the mobile users especially the young ones give a damn to the manners and we usually find the mobile phones beeping and ringing in the class rooms. Young people glued to their mobile sets taking trifles incessantly is a familiar scene. Excessive use of mobile phone may also results in physical and mental impairment. Most of the people use mobiles driving which results in serious accidents on the road. A slight distraction can prove fatalistic. 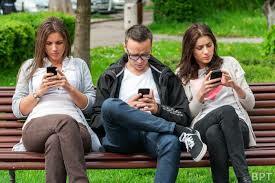 For some people mobile phones is a past time activity who have nothing serious to do but fidget to their mobile sets. This sort of behavior is a sign of psychosocial nervousness. Moreover the race to get better the latest and the trendiest mobile phone is another psychological situation. The influx of the mobile companies has also contributed to mobile mania. Advertisements sleek bill boards commercial and the numerous consumerist gimmicks attract people to process mobile phone. It is on these grounds that I strongly condemn the unnecessary use of mobiles. A balance and wise approach towards technology is always beneficial. Mobile phone has become an integral part of an individual's life in the present time we live in a world in which communication is the most important thing and it is not only communication but a rapid communication that has an added value in the consumers life. The conservative mind is increasingly critical of a mobile phone but can not deny its massive significance in the present world. Mobile phone has reduced the risk factors involved in human life. Gone are the days when one has to depend upon the conversional telephone or other modes of communication like postal services and telegram because the world has turned into a global village. Therefore one can neither survive nor compete in the global village without adopting and consuming its utilities. Mobile phone has made life comfortable up to date and valuable. Communications is the theme behind this device or gadget. So the right choose of the mobile phone is the greatest benefit of modern days technology. The business and the commercial world is almost dysfunctional without communication. Mobile phone has removed the vacuum of dis- communication.